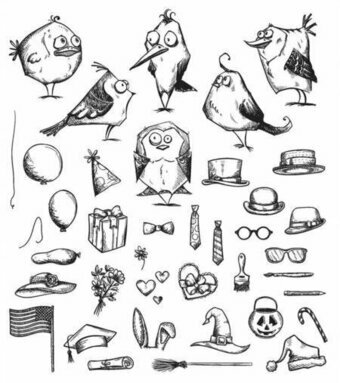 Clear stamps featuring a bird and leafy vines. Sizzix Clear Stamps offer a variety of dazzling designs for your next cardmaking, scrapbooking or papercrafting challenge. Just stick the Clear Stamp onto an acrylic stamp mount for simple see-through positioning and you're ready for quick and easy stamping! 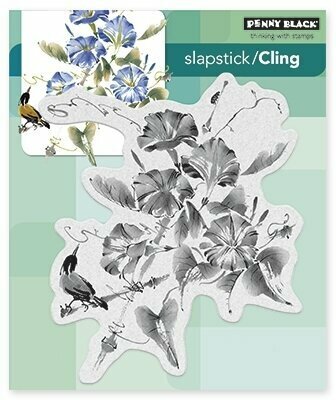 Penny Black clear stamps featuring birds, flowers, and the sentiment "Happy Wishes". Thirty nine deeply etched red rubber cling mount rubber stamps that adhere to any clear acrylic block. Mini Crazy Bird (top left) measures approximately 1 3/8" x 1 5/8", all Mini Crazy Things scaled to fit all birds. Overall stamp sheet size: 7" x 8 1/2". Stamps come on a 3-hole punched sheet. This peacock portrait is perfect for creating a lovely Frantage card with a vintage look. Image measures approximately 3-1/2" X 4-7/8". This original design by Fran Seiford is deeply etched and precision cut from premium gray rubber on a 1/8" gray rubber foam backing then mounted on a premium American hardwood handle with decal image on top. Made in the USA. Clear Stamp from Impression Obsession featuring a bird. 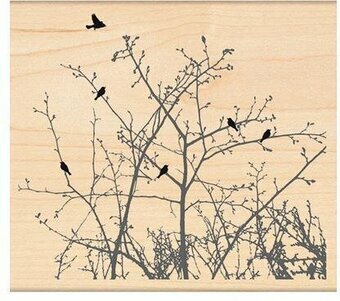 A winter-themed Penny Black wood stamp featuring birds in trees.